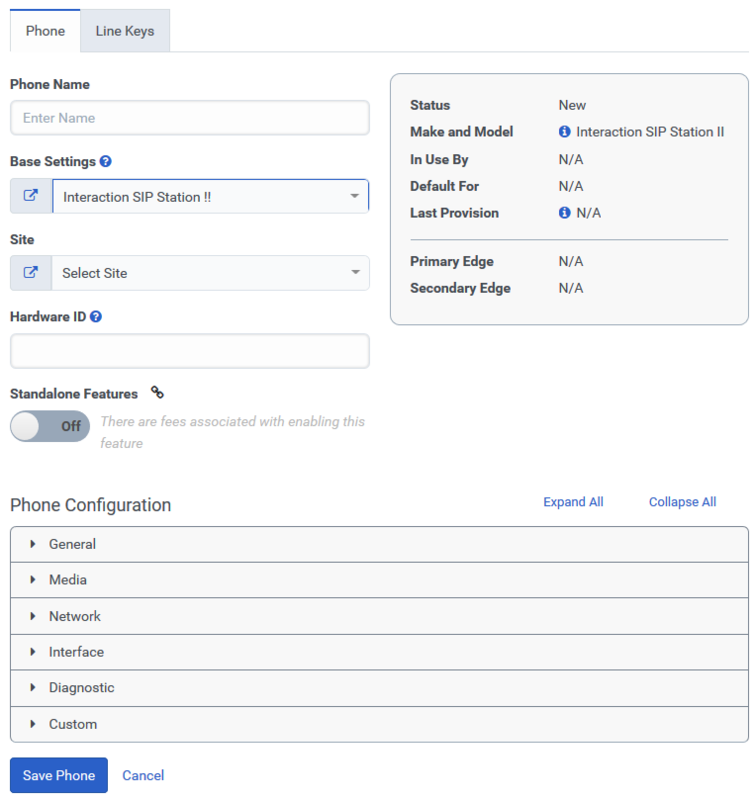 Once you have created an Interaction SIP Station II phone base settings profile you can create the phone profile. This profile contains a group of settings found on the Phone and Line Keys tabs that define the phone in PureCloud. The majority of the settings on the Phone and Line Keys tabs are inherited from the base settings. However, you can customize the phone by altering any of the settings that it inherited from the base settings configuration-without effecting the original base settings configuration. See Inherited settings. From the Base Settings list, select the base settings configuration you created. Leave Standalone Features set to Off unless you are creating a conference room phone. See Enable standalone features. To customize the phone configuration settings, proceed to the Customize the phone section of this article. 管理者パスワード This is the administrative password that you use when configuring the phone from the Web interface. By default PureCloud masks the password, but you can select the Show Password check box to see the password in plain-text. Disabled: Allows manually setting the timezone based on GMT. When Timezone Discovery is Enabled, this setting is automatically configured from DHCP. When Timezone Discovery is Disabled, use this field to set the number of hours to offset the time of the phone from GMT. Enabled (Default): Allows Daylight Savings Time (DST) to display on the phone. Use the Start and End fields (Week, Day, Month, and Time) to specify the period that DST is in effect. Sidetone Gain: Sets the level of the sound picked up by the phone’s mouthpiece and instantly transmitted to the earpiece. Use Edge Use the Edge to obtain provisioning information. Enter the URL that the phone uses to obtain configuration information (provisioning). If this parameter is not present, the phone uses DHCP INFORM to determine where to get its provision data. Use this setting to configure how the Message Waiting Indicator (MWI) – the light that blinks to indicate that the user has a new voicemail. Set the number of seconds to wait between the entering of each digit. Use the toggle to enable or disable a phone’s ability to log data. 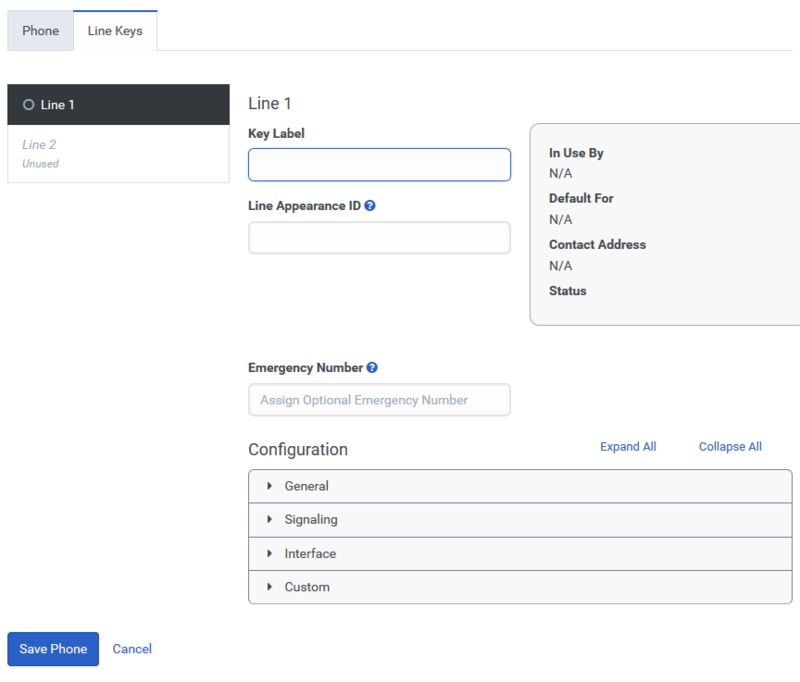 If you want to specify a call back number to be sent when a call is made to an emergency service, type that number in the Emergency Number field. Proxy Keep Alive Timer Defines the proxy keep alive time interval (in seconds) between keep alive messages. UDP Settings If Protocol is set to UDP, which is the default setting, the UDP Settings section appears. UDP T1 timeout Sets the amount of time, in milliseconds, before the UDP T1 connection times out. UDP T2 timeout Sets the amount of time, in milliseconds, before the UDP T2 connection times out. To use your custom line key settings and complete the Interaction SIP Station II configuration procedure, click Save Phone.